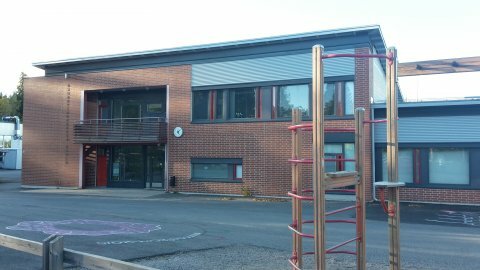 The school of Rovastinkangas is an active school with more than 200 students and 20 teachers. The students are from six to twelve years old and there are classes from preschool up to grade six. The school is located in the central Finland, in a small town called Orivesi. The focus of the school is on skill and art subjects such as PE, music, art, handicrafts and media skills. In addition to those the students also study English on every grade, also in preschool. Here in Orivesi all the elementary schools emphasize the enterprising spirit of the students and the responsible way of life in general. Our school aims to support the student’s attitude towards learning and to give them positive “I can do this” -feeling. We encourage students to take responsibility for their own learning at a very early stage. The teachers on grades 0.-2. plan lessons and work together in order to form an individual course of learning for every student. The teachers work together as teams and on some occasions we practice simultaneous teaching which means that two or more teachers teach together a group of students. This working method enables us to be more creative, share responsibility and focus on wider learning contents and projects. This phenomenon-based learning gives students a more versatile understanding on subjects and motivates them to see connections between things in their daily lives. One of our specialities is teaching English on every grade. Normally English starts on the 3rd grade in Finland. We strive to encourage students to use their language skills in their daily lives. We also have international projects and other connections. Our school is an international school with students from different cultures. Sport and outdoor skills are a part of our daily routine and students have recess outside between their lessons. We also concentrate on sustainable development and on environmental issues. Art and media skills are also our interests. We cooperate with the vocational school Tredu which is located next door. The school of Rovastinkangas offers morning and afternoon activities for our students and different clubs after school hours. You are warmly welcome to pay a visit to our active and enthusiastic school!